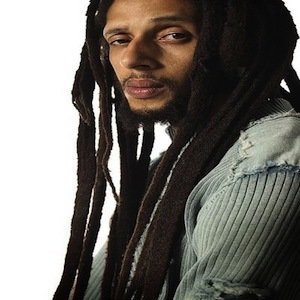 Julian Marley, son of reggae legend Bob Marley and Barbados-born Lucy Pounder is a Grammy award nominated, roots-reggae musician, singer-songwriter, producer and humanitarian.In the same tradition as his father, Julian “Ju Ju” Marley is a devout Rastafarian whose music is inspired by life and spirituality. During Julian’s formative years in Jamaica, he began to study under legendary reggae veterans such as Aston “Family Man” Barrett, Carlton Barrett, Earl “Wire” Lindo, Tyrone Downie and Earl “Chinna” Smith, all of whom inspired the then fledgling song-bird. In 1987 when influential Wailers drummer Carlton Barrett was murdered outside of his home in Jamaica , Julian wrote two un-released songs , ‘Uprising’ and ‘What They Did Wrong’ in response to the incident. Subsequently he also formed a band called The Uprising, a roots-reggae band comprised of young Jamaican players. Julian and the Uprising would go on to open up for his brother Ziggy Marley’s band, The Melody Makers and performed with The Wailers which at one time included Carlton Barrett’s son on drums. In 1996, Julian released his debut entitled, Lion in the Morning, which launched him into the public eye. The album was a conscious effort and culmination of his musical development to date, and reflected Julian’s growing maturity and musical sophistication. Recorded at Tuff Gong studios in Kingston, Jamaica and the newly renovated Marley Music studio at Hope Road (the same studio where his father created some of his most important and well-known work) Lion in the Morning is Julian’s own testament that clearly reflects his roots and heritage. Produced by Aston “Family Man” Barrett and Stephen Marley, the album additionally features contribution rolls from reggae luminaries such as Owen “Dreddie” Reid, Earl Chinna Smith, Tyrone Downie, and Julian’s siblings Stephen Marley, Cedella Marley and Sharon Marley. The record was followed by a successful international tour with The Uprising, which included Jamaica’s Sumfest and Sunsplash shows, a Marley Magic family performance during New York City’s Central Park Summer Stage Concert Series, and touring into the territories of Japan, Brazil and Mexico. That year, Julian also began to tour extensively with his brother Damian, and the duo landed a featured artist position on the 1997 Lollapalooza tour. In 1998, Julian contributed a vast range of musical elements to singer Lauryn Hill’s Grammy Award winning album, The Miseducation of Lauryn Hill, which was recorded at Tuff Gong studio’s in Jamaica, including playing guitar on the single, “Forgive Them Father”. In 1999 , Julian went back to work in the studio with his brothers Stephen and Damian , and contributed to the production of the platinum-selling Chant Down Babylon, a remix album by various hip-hop and rock artists covering Bob Marley & The Wailers songs, produced by Stephen Marley. In 2002, Julian and his brothers Stephen and Damian officially incorporated Ghetto Youths International, Inc., the family owned record label that was first founded by Ziggy Marley and Stephen Marley in 1989. The label allows the brothers to work closely with each other on musical collaborations. The Marley brothers also produce and release a catalogue of works featuring various artists for the Ghetto Youths imprint, including their own material, a venture that has successfully carried on the Marley tradition of communicating music to a global audience. In 2003, Julian joined his siblings Stephen, Cedella, Damian, and Kymani to contribute a version of the single, ‘Master Blaster’ for Stevie Wonder’s tribute album entitled, Conception: An Interpretation of Stevie Wonder Songs. That same year, Marley also recorded his sophomore effort entitled, A Time and Place at the Lion’s Den in Miami. An organic fusion of rootical reggae and jazz, A Time and Place was produced by brother Stephen Marley, and the album cemented Julian’s next milestone on his artistic path. Each track on the album was built on a solid foundation of traditional reggae, but contained a wide range influences which showcased Julian’s love for music. After several years of touring with Ziggy Marley and the Melody Makers, the Ghetto Youths Crew, and his brother Damian “Jr. Gong” Marley, Julian had created a worldwide fan base for himself. Now, with the release of his sophomore album, Julian embarked on his own world tour that was backed by his band The Uprising, and circled Europe and the United States two times in support of A Time and Place. In 2004, the Roots Rock Reggae Festival in the United States gave Julian the opportunity to unite and perform with all of the Marley brothers. Julian along with the Marley family also went on to perform a series of family ‘Africa Unite’ performances, including in Ethiopia in 2005, in Ghana in 2006, and in Jamaica in 2008. At the invitation of the Jamaican government, Julian Marley and The Uprising performed during the 2008 Olympic Games in Beijing, China, and celebrated along-side Jamaica’s Gold medal-winning runner, Usain Bolt. As with the other Marley’s, Awake blends R&B, hip hop, dancehall and of course the roots reggae that his father made famous around the world. The album’s first single, ‘Boom Draw’, is a blend of classic roots and modern dancehall. Julian’s brothers also appear on the album, with Stephen Marley collaborating on ‘A Little Too Late’ and Damian “Jr. Gong” Marley contributing his talents to ‘Violence in the Streets’. Another track, ‘Oh Girl’, features vocals by rapper Mr. Cheeks and Marcia Griffiths, a former Wailers backing vocalist and reggae star in her own right, also contributes background vocals to the album. Julian’s ‘Awake’ world tour with his band The Uprising flourished in 2009, and stemmed into a major North American, Caribbean and European run that included the Raggamuffin 2010 tour of Australia and New Zealand. In May 2010, Awake took home the award for ‘Best Album of the Year’ at the International Reggae and World Music Awards (IRAWMA) in New York City. Marley’s tour with The Uprising continually expanded in 2010, and performance dates found the reggae singer-songwriter circling Europe, and scheduling back to back headlining performances in the U.K., Greece and South America.